Kevi thought he would work in Public Health management. Right before taking up his first job in a nursing home, however, he had a sudden change of heart. “Let there be fun! Let there be sun! My calling is tourism.” This must have been the right decision for this now full-time Paris guide. The Notre Dame tour is his forte – “how to become a 13th century peasant”. 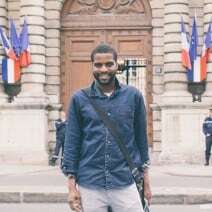 Kevi is also the creator of Black Paris Walking tours.